Democrats wanted to stop borrowing $700 billion for tax cuts for the rich. Today, Senators Olympia Snowe (ME) and Scott Brown (MA) voted no. This week, Rep. John Boehner (OH) called the Dem plan "chicken crap" and voted no -- Rep. Eric Cantor (VA) also voted no. 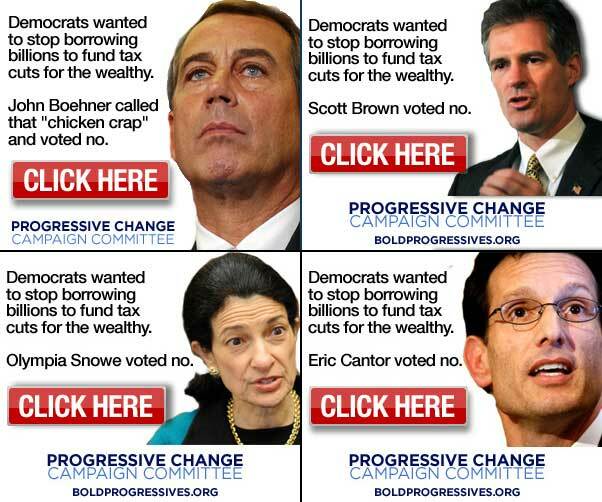 Can you chip in $3 and help fund more online ads in Snowe, Brown, Boehner, and Cantor's states, so we can hold them all accountable?